After complaining all the livelong day that Team Fedor Emelianenko had mastered the fine art of dodging, only to have the Russian finally call for a shot at his Strikeforce crown earlier this week, champion Alistair Overeem is now claiming his Outlook calendar is fully booked. “I’m going to fight in the K-1 tournament, so my first fight will be October for the Final 16 in Korea. If I win the fight, I will advance to the Final 8 in Japan. 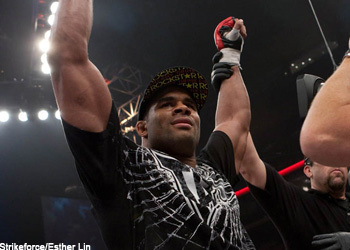 That fight will be in December,” Overeem told MMAFighting.com. It appears Fedor’s abrupt exile from the land of the untouchables has caused the controversial Dutchman to reorganize his hit list, and unfortunately “The Last Emperor” is no longer between his crosshairs. Becoming a K-1 king is awesome and all, but surely an opportunity to co-star in the biggest heavyweight scrap currently available in MMA is worth the sacrifice, ain’t it? “No, unfortunately not. The reason is because if I enter the Final 16 and win, I will fight the K-1 Final in December. My decision was made because nothing was certain and Strikeforce and M-1 didn’t act fast enough when I made my decision to start K-1 training,” Overeem added. “Now I read on the internet that Fedor and his management want to fight me all of sudden. Thanks to the upset special Werdum served up earlier this summer, there’s a brand new pecking order in Strikeforce’s heavyweight class. In case you didn’t receive the memo, Ubereem rattled it off again just to make sure there’s no confusion. “Number two is clearly Werdum because of his win over Fedor and Antonio Silva. Fedor losing means he’s number 3 and Antonio Silva, who came back from a loss against Werdum by defeating Arlovski is clearly the number 4,” he suggested. “So in that case, Fedor should fight Antonio Silva and the winner of that fight should fight against the winner of a bout between myself and Werdum. It’s just that simple, it’s not rocket science.